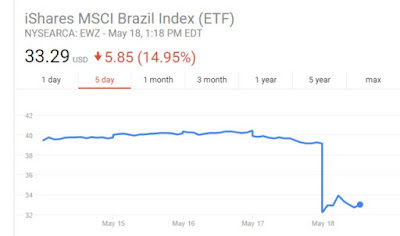 As I report at EPJ, the Brazillian stock markets are in crash mode today as a result of news President Michel Temer was caught on tape endorsing a bribe. 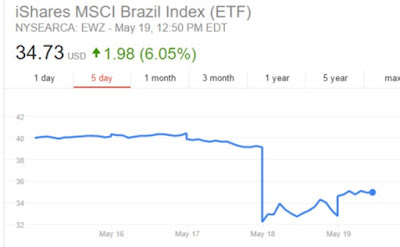 As I write the iShares MSCI Brazil Index ETF is down approx. 15%. Here's the thing, Temer is far from a popular president now. He has an approval rating of only 9%. Things, in the short-term, will not get worse under a new president. 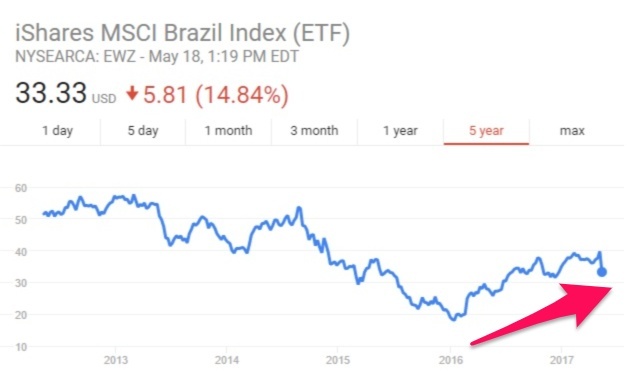 I don't trust Brazillian money supply numbers but an examination of the long term chart (above) of the IShares Brazil etf shows a very strong market since early 2016. It is up 116%. Today's drop is merely a dip. 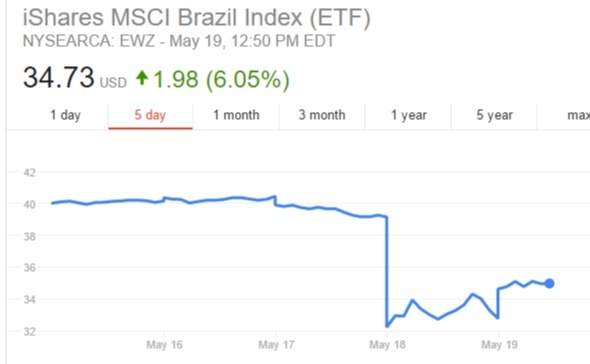 Thus, for risk-oriented traders, and I emphasize risk-oriented, this is an opportunity to jump in and buy EWZ for a quick trade. I am not looking at this as a long-term investment--just a trade, I am going to be out of the position either Friday or Monday at the latest--profitable or not. I am just trying to scalp panic here in an otherwise bull market. 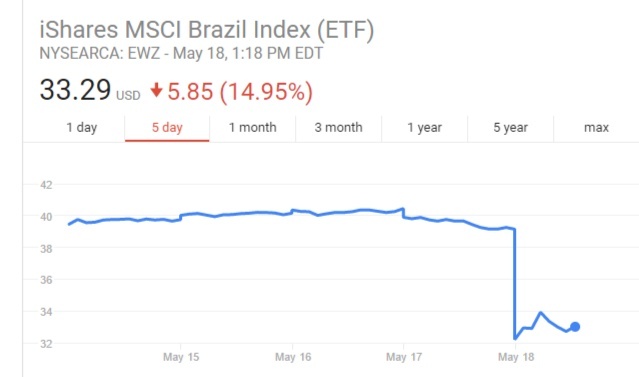 Yesterday, I put on a BUY recommendation for aggressive traders to take a position in iShares MSCI Brazil Index (ETF). I stated that it was a trade to "scalp panic" on news that the Brazilian president was caught on tape encouraging a bribe. I also noted that I would be out of the trade either today or Monday. 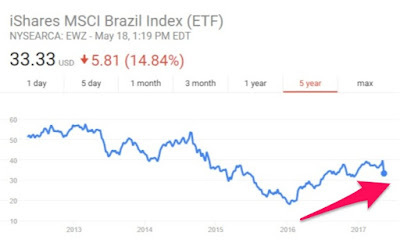 Well, the ETF is up 6.0% plus today. That's a nice scalp. take profits. I hasten to add that I advised buying into Brexit panic. Buying into any downside action following past Fed rate hikes and buying into a Trump election victory. Nobody buys panic like I do. You can't do it on just any major panic but when the conditions are right you have to jump. To see the four ways you can subscribe to the EPJ Daily Alert click here. Past spectacular advice does not guarantee future spectacular advice.